An all-star cast. Great story. Obviously well acted. I admire George Clooney more every day. He is on my top five list of people I would love to have dinner with—-though I suspect he and I would argue a lot. Kudos to George for making this story into a film. It should be admired. There was one problem. This was not a great movie. 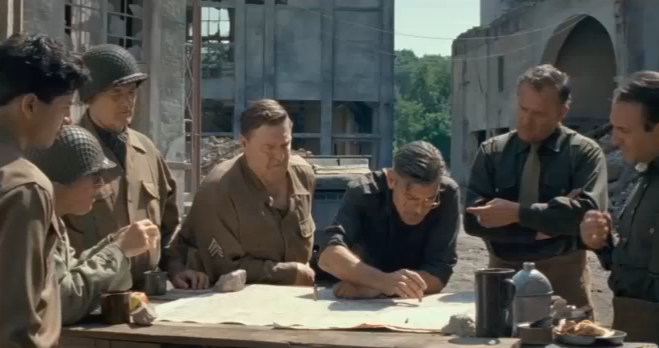 The Monuments Men is an drama about some middle aged men being drafted into a World War II platoon to save great works of art threatened by Hitler and the Nazis. Think Space Cowboys (2000) meets Stripes (1981) without as much charm and humor. My expectations were unfortunately huge for this film. It had been hyped more than Susan Rice pushed the ” Innocense of Muslims” for causing the Benghazi massacre. The trailers have all the funny and interesting scenes. The rest is really a dramatic documentary, and for that, it has great value. TMG just walked out of the film feeling, “okay, nice film, let’s get dinner.” Don’t get me wrong. The film and its story are monumental….literally. But great movies are a different thing. This just was not a great movie. I might have easily tolerated an another hour of this film, perhaps going into greater detail of the Nazi stealing machine or more behind the scenes action to save it—even the politics to make it happen. I was thinking more like Charlie Wilson’s War (2007). I would have gladly traded two hours of the wasted time in The Wolf of Wall Street for more education on great works of world art. The one great moral question this film posed was the value of human life versus the value of historic works of art. Clooney, as art warrior Frank Stokes, states unequivocally near the end that saving the artwork was worth men’s lives. I am not sure I am convinced. I think his statement that the men who died would have felt their effort was noble and just to fight evil like the Nazi’s was worth it, …but their lives for canvas with paint and carved marble? TMG thinks human life is more scared and valuable. Reasonable efforts? Sure. But there will be more great artists and more great works made. Saving the past is hugely important, but not at the cost of my Dad’s life (who survived WWII) or that of my son or daughter. This was a point well made in this film by the Army leaders who had already seen way too many young men and women die. They were not going to risk more lives to save pictures. I think their viewpoint may have been too dismissed in the film. Go see this film. Support what it stands for. Take your children. Educate them on the meaning of guts, bravery, principals, evil, culture and goodness. Just don’t expect a great movie. But thanks George. TMG does appreciate the effort.